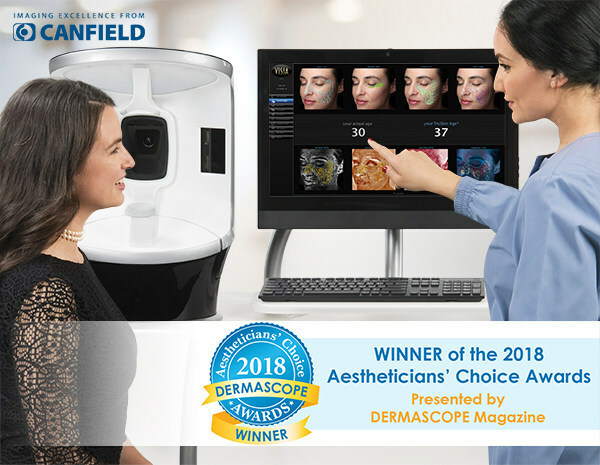 Conducted by Dermascope Magazine, VISIA Complexion Analysis System was voted as the winner of the 2018 Aestheticians' Choice Awards. VISIA Complexion Analysis System delivers clinical quality images, and its 3D viewer makes it easier to clearly relay aesthetic procedures like skin resurfacing, skin tightening, skin rejuvenation, and others to your patients. With the ability to provide 8 different in-depth skin complexion analysis elements, VISIA is the only complexion analysis with a rotating image capture module for faster & more comfortable capturing session. The award-winning VISIA delivers a state-of-the-art skin care consultation experience for your patients. As compared to other systems, the updated software in VISIA allows a faster image capture, further refining the detection of your patient’s facial feature, and automatically classify skin types. Learn more about VISIA here. Contact us to schedule a demo at your practice today.